An electron microscope is a microscope that uses a beam of electrons to produce an image of a sample (rather than using light like in a standard microscope). There are several ways of obtaining an image, but the original was the transmission electron microscope (TEM), which produces an image by passing an electron beam directly through the sample. Electron microscopes offer a significant advantage in resolution over traditional light microscopes. This is due to the fact that the wavelengths associated with electrons are much shorter than those associated with visible light. It possible to achieve resolutions of up to roughly 10,000,000 times magnification using electron microscopes, as compared to about 2,000 times magnification in the best light microscopes. 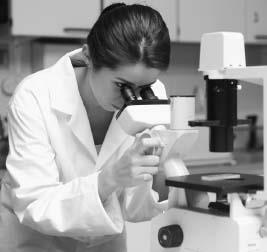 Simple optical microscopes work by magnifying images using lenses.